BOE Financial Subcommittee | Cherokee Co N.C.
MURPHY, N.C. – At the Thursday, March 8, Cherokee County Board of Education (BOE) meeting, Dr. Jeana Conley, school superintendent, delivered an update on current school safety guidelines and policies as well as plans for continued improvement in this area. After the Feb. 14 school shooting at Marjory Stoneman Douglas High School in Parkland, Florida, which claimed the lives of 17 students and staff, many school systems across the region have reviewed safety measures and taken steps to enhance safety procedures at school campuses. Cherokee County School Superintendent Dr. Jeana Conley, center, addresses school safety at the Cherokee County Board of Education meeting Thursday, March 8, with board members Paul Brown, left, and Jeff Tatham, right. Conley told the board several local meetings have taken place with principals, school resource officers (SROs) and other law enforcement officials since the Florida tragedy in an effort to review safety procedures and priorities. Currently, a number of measures are in place or are being established to enhance the safety of Cherokee County Schools. The superintendent explained comprehensive safety and emergency response plans are in place at each campus across the school system and all staff have been trained for emergency response. Additionally, the school board is currently reviewing a re-evaluation of the system’s safety preparedness policies and will recommend further actions at its April BOE meeting. 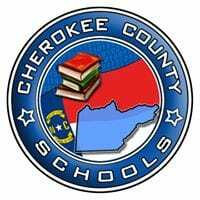 Students will receive updated safety training and instructions Tuesday, March 13, which has been designated Student School Safety Awareness Day by Cherokee County Schools. Also, monthly emergency drills are being conducted at all county schools. Conley also stated Cherokee County Schools has received a grant to help secure a fifth SRO to serve at its 12 campuses countywide. The school system also plans to ask for additional funding for enough SROs to serve at all 12 schools on a full-time basis, Conley added. Other improvements include the installation of keyless-entry hardware at school entry access points and school security cameras at school sites. “All of our school administrators and counselors will be receiving professional development in threat assessment protocol to better identify students who are in need of support and further attention,” Conley informed the board. A new and improved Safe Schools Alert, which allows individuals to report safety and security concerns anonymously via email, phone or text message, is also in the works, according to Conley. The superintendent also stated she would like to see veterans, retired law enforcement, and other willing volunteers take part in an overall safety plan for each school. “Caring community members can make an impact, just with a physical presence. We are hosting meetings in each area to explain how to become a volunteer and receive the volunteer application packet,” Conley said. Cherokee County Schools have also adopted the “Run, Hide, Fight” emergency protocol enacted by the state as a method to counter an active-shooter event. Conley stated this method is applicable not only for students at schools but also at any public place where an active-shooter event takes place. 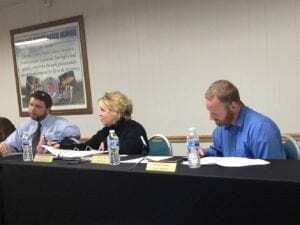 In other business, a number of potential purchases were presented for approval by Winfield Clonts, board member and chairman of the board’s financial subcommittee. The board awarded a contract bid to Ben Hill Roofing & Siding in the amount of $343,900.00, which was the lowest among four received bids, to replace the roof of the Andrews High School gymnasium and cafeteria buildings. Though Conley admitted the project might come with a “sticker shock,” she added the roof replacement is a necessary project, stating games played in the gymnasium in the past have had to be stopped during heavy rains. The purchase of a new scoreboard for the softball field at Murphy Recreational Park was approved. Clonts explained the Murphy High School girls softball team uses the field for its games, and the school board will split costs for the scoreboard with the recreation park. The cost to Cherokee County Schools will be $1,537. The board also approved the purchase of 68 new stools for the Murphy Middle School cafeteria in the amount $2,485. Clonts further explained the table tops in the school’s cafeteria remain in good condition. A $3,312 project to resurface the infield of the Hiwassee Dam High School baseball field.